New South Wales might have drawn first blood against Queensland in State of Origin Game 1, but when it comes to value for money in the property market, that result is turned dramatically on its head. Some Sydneysiders couldn’t bear the thought of living anywhere other than the heart of their city, and pay a princely sum for doing so. 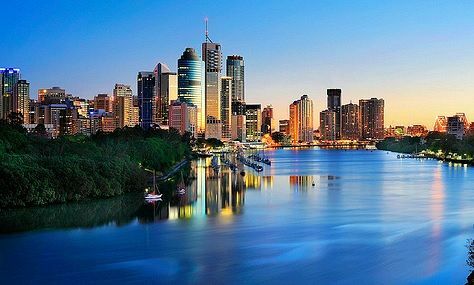 But venture north to Brisbane and things are decidedly more attractive for property buyers who want a little more bang for their buck. Here’s what you’ll get for your money in the two rival cities. Search for houses worth $500,000 or less in Sydney’s CBD and its surrounding suburbs and you’ve got seven options. Yes, SEVEN. Actually, make that five, considering one of those properties is an office suite, and another is a serviced apartment that you can’t actually live in. But for $415,000 you can grab yourself this 25sqm studio at 8 Dixon St, which has enough room for a bed, a table, a small bathroom and a kitchenette. There’s no car park, but it’s currently tenanted for $460 per week. You can easily pick up a two-bedroom apartment for less than $500,000 in and around Brisbane City, but this one-bedroom pad at 205/30 Macrossan St with a car space and a balcony with views of the Brisbane River is hard to beat at $435,000. For that you’ll also get a decent-sized balcony and an internal laundry, as well as access to the building’s pool, spa, steam room, BBQ area and tennis court. Don’t be expecting anything extravagant if you manage to push your budget up to $750,000 in central Sydney. This cozy little one-bedder at 178/198 Sussex St is quoted at between $680,000 and $715,000, and has a small living room and separate dining area, as well as a bathroom with a shower and a bath. It’s also only a stone’s throw from Darling Harbour and has access to a pool and gym, but still no car park. For a little over $650,000 in Brisbane you can get your hands on these views of the stunning Roma Street Parkland, with a modern 109sqm two-bedroom, two-bathroom apartment to boot. And in a massive win for Origin and Broncos fans, the apartment at 3098/3 Parkland Boulevard is just down the road from Suncorp Stadium. For the $1 million bracket we’ve ventured out to some of the suburbs rated as each city’s most popular, and for that price you can set yourself up just down the road from the Prime Minister’s official residence in Sydney in Kirribilli on the north shore. Yes, you’ll get stunning views of the harbour, as well as a Kirribilli address, but your $900,000 will also get you only one bedroom, though at this price level you’ll at least have somewhere to park your car. It’s hard to believe that this Paddington pad is just 3km from Brisbane’s CBD. Three bedrooms, two bathrooms and a stunning tropical garden out back would fetch mega bucks in Sydney. The home at 52 Warmington St will be auctioned on July 1 and last sold for $820,000 in 2010. Now we’re into some of the nation’s most expensive suburbs, and with a median price of $5.7 million, Darling Point just about takes that crown. For about a third of that price you’re looking at a two-bedroom, one-bathroom, no-balcony apartment with an older kitchen. It’s certainly hard to knock those views, though. The property at 31/11 Yarranabbe Rd goes to auction on July 11. At $1.5 million, this four-bedroom stunner in one of Brisbane’s most expensive suburbs, New Farm, is an absolute bargain compared to what you’d get for the same money down south. Split over two levels and with an outdoor deck, a separate courtyard, three bathrooms, two car spaces and a media room, it gets our vote and lies just 4km from the city.